Joachim von zur Gathen and Jürgen Gerhard. Textbook, 3rd edition, Cambridge University Press 2013 (publisher site). Computer algebra systems are gaining more and more importance in all areas of science and engineering. 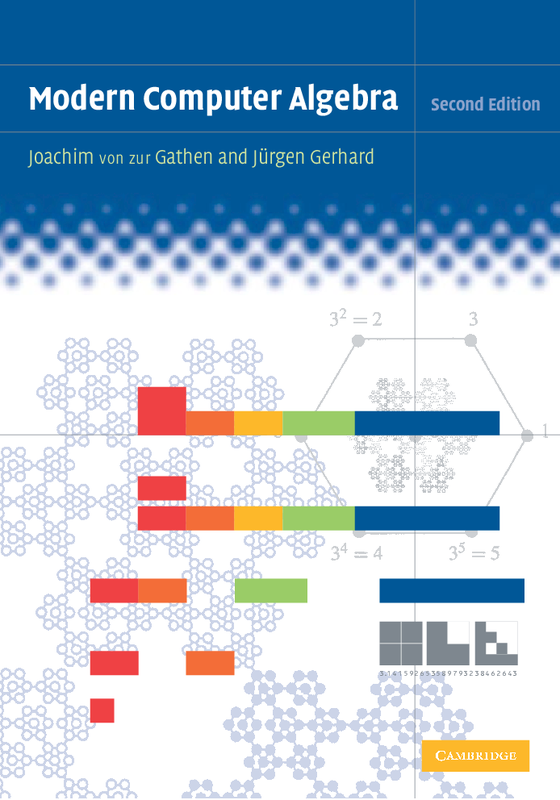 This textbook gives a thorough introduction to the algorithmic basis of the mathematical engine in computer algebra systems. It is designed to accompany one- or two-semester courses for advanced undergraduate or graduate students in computer science or mathematics. Its comprehensiveness and authority make it also an essential reference for professionals in the area. Special features include: detailed study of algorithms including time analysis; implementation reports on several topics; complete proofs of the mathematical underpinnings; a wide variety of applications (among others, in chemistry, coding theory, cryptography, computational logic, and the design of calendars and musical scales). Some of this material has never appeared before in book form. Finally, a great deal of historical information and illustration enlivens the text. 808 pages, 55 b/w illustrations, 53 colour illustrations, 40 tables, 560 exercises.